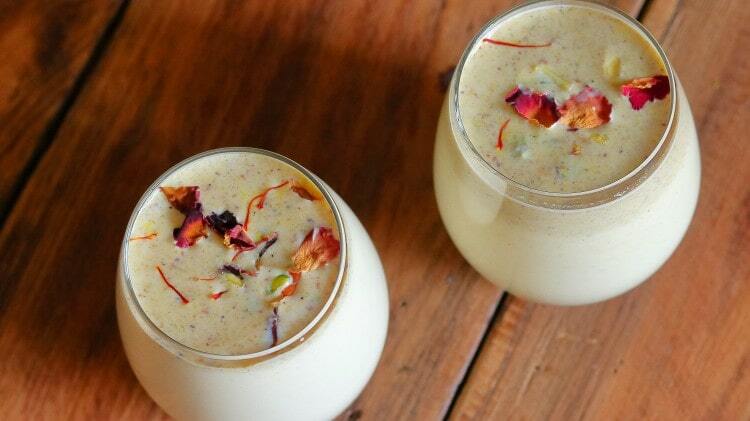 This holi enjoy the instant thandai recipe. It’s delicious, refreshing and very easy to make. In less than 10 minutes this thandai powder recipe can be made at home! YES!! Takes only 10 MINUTES! Every year we make thandai during holi, it’s a tradition we have been following since I was a little child. The spices added in this thandai powder recipe makes it so unique and adds such a lovely flavour to it. It’s our family recipe which we have been following sine years now and is definitely a keeper. It’s one of my favourite drinks and every year I look forward to holi because I loveee having thandai with my friends and family and celebrate this festival of colours. In a mixer grinder add almonds, cashews, pistachios and melon seeds. Grind them together till it forms into a fine powder. Don’t churn them in one go, else the nuts will release their oil. Grind for 5 seconds, stop, grind again and repeat till it forms into a fine powder. Once done remove it into a bowl. In the same jar add all the spices like, black pepper, fennel seeds, poppy seeds, cardamon, cinnamon stick, dried rose petals, star anise powder and saffron strands. Grind them till they form into fine powder. Now mix the spices with the dried nut powder and mix till well combined. The thandai powder is ready. Store it in an air tight container in the refrigerator for up to 3 months. To prepare 2 medium size glasses of thandai, add 3 tablespoon of thandai powder in a small glass of hot milk and keep it aside for 30 minutes. In a separate jug add 2 glasses of cold milk along with sugar (as per your taste, I added 2 tablespoon) and mix till the sugar is completely dissolved. To the above cold milk add the thandai powder milk that we had prepared earlier and mix well. Keep the thandai in the refrigerator to chill or add ice cubes and serve it instantly. If you want to make the thandai the traditional way, then soak the dried nuts overnight and grind them into a fine paste the next day. Rest the entire process remains the same. While making the thandai powder, don’t churn the dried nuts in one go else they will release oil. For a fine thandai powder, sieve it. If you don’t have time, then skip the process of adding thandai powder in warm milk and add it directly to the cold milk and serve child. You can use full fat or low fat milk. But preferably full fat milk gives a better taste. In a mixer grinder add almonds, cashews and pistachios. 2. Now add melon seeds and grind till it forms into a fine powder. 3. Don’t churn them in one go, else the nuts will release their oil. Grind for 5 seconds, stop, grind again and repeat till it forms into a fine powder. 4. Remove the thandai powder into a bowl. 5. Now in the same jar add black pepper. 8. Add dried rose petals. 9. Now add cardamom and cinnamon stick. 10. Add star anise powder. 11. Finally add the saffron stands. 12. Grind them together till they form into a fine powder. 13. The spices are perfectly done. 14. Now add the spices mixture to the nuts powder and mix till everything is well combined. 15. The thandai powder is ready. 16. To make 2 glasses of thandai, take a small glass of hot milk and add 3 tablespoon of thandai powder and mix well. 17. Now keep it aside for 30 minutes. ( If you don’t have time you can skip this process and add the thandai powder directly in cold milk. 18. In a jug add cold milk and sugar and mix till the sugar dissolves completely. 19. Now add the thandai powder milk in the cold milk and mix well. Keep the thandai in the refrigerator to chill or add ice cubes and serve instantly.